I guess in every sailors life one has to learn the art of line splicing. This is taking one long piece of line and looping at around a thimble to make an eye in the line like this picture of our 30ft rope for our mooring. Or here is the wiki definition: "Rope splicing in ropework is the forming of a semi-permanent join between two ropes or two parts of the same rope by partly untwisting and then interweaving their strands. 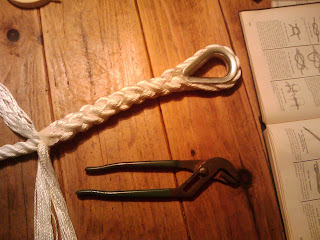 Splices can be used to form a stopper at the end of a line, to form a loop or an eye in a rope, or for joining two ropes together. Splices are preferred to knotted rope, since while a knot reduces the strength by as much as 40% or more, some splices can retain up to 95% of the strength of the line. However, splicing usually results in a thickening of the line and if subsequently removed a distortion of the rope. Most types of splices are used on 3 strand rope, but some can be done on 12 or greater strand braided rope." It is super super satisfying. I think I am good at it because of my extensive background in braiding hair. hehe. Anyways this is a picture of my first attempt at line splicing. Dan's dad said "That's really good for a beginner, wait that's just really GOOD! ", which made me very proud of my work. Thanks Clyde for teaching me how to do this. He told me people pay for line to be spiliced. I say "bring it". Thats just another way for me to make money. The things I am best at on the boat are the tedious things. I think i will stitck to the painting, sanding, sail covers, flags and line. Which are the craftiest things. And leave the angle grinding and fiberglassing to the guys. Look at you all line splicing. How is your guys boat doing? have you guys taken her out?